Pork is a powerhouse of nutrition! Pork contains many of the nutrients recommended by Health Canada. Every bite provides high quality protein, energy, and key vitamins and minerals. All pork cuts, with the exception of ribs, qualify as “lean” or “extra lean” and fit well into a healthy eating plan. 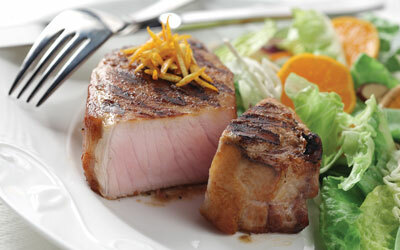 Fresh pork cuts are naturally tender and low in sodium. Fresh pork contains no trans-fat or hydrogenated fat. The only meats that contain trans-fat are from ruminant animals (beef, lamb, goat). The fat in pork is mostly in the form of poly- and mono-unsaturated. Pork is the leading food source of thiamin, an essential B vitamin. Canadian pork is 44% leaner than in the 1970s, due to improved breeding and feeding practices. Pork is classified as a “red” meat because it contains more myoglobin (an oxygen holding protein) than chicken or fish. A serving of lean, trimmed, cooked pork is about the size of a deck of cards or the palm of your hand.